Well, that’s a strange omen. 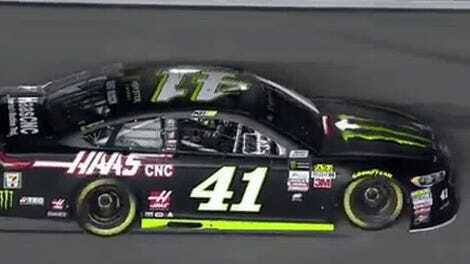 At just 17 laps into the unofficial start of the newly renamed Monster Energy NASCAR Cup Series season, the first caution of the year was an ugly wreck by, oddly, the Monster Energy-sponsored race car of Kurt Busch. Footage from the wreck shows the No. 48 of defending series champion Jimmie Johnson sliding down the track and right into the No. 41 of Busch during the Advance Auto Parts Clash at Daytona International Speedway, sending Busch straight into the outside wall. Busch then went plowing through the infield grass on the front stretch, flattened nose and all. The good thing, for Busch, is that this race doesn’t matter for much. The Clash is just an exhibition race between drivers who met certain qualifications, worth nothing more than bragging rights and television time. But the wreck did add to Busch’s bad luck in the series’ return to Daytona, considering that he lost a window in the final practice for this race earlier in the weekend. Perhaps the best thing about this footage, which you can see in the video replay at the top of this post, is how well the SAFER barriers on the outside wall did their job when Busch slammed into it. The car bounced right back off rather than smashing into an unprotected concrete wall, likely making the wreck hurt a whole lot less than it could have.